Household batteries may contain toxic metals and should never be put in your trash or blue bin. Batteries come in all shapes, sizes and types; each with different disposal requirements. Learn how to tell battery types apart. 1. Drop off at Wegmans and Green Hills Market. Battery collection boxes at these locations have separate collection containers for alkalines, rechargeables and button batteries (including hearing aid and watch batteries). This drop off is for households only, batteries from businesses are not accepted. Click here for business options. Deposit alkaline, zinc carbon and non-rechargeable lithium batteries in the large container. They do NOT have to be put in individual plastic bags. Put each rechargeable battery (including lithium-ion) in an individual plastic bag (provided) and place in the special container labeled "Rechargeable Batteries." Place button batteries in the container labeled "Button Batteries." The button batteries do NOT have to be in plastic bags. 2. July Curbside Collection = Alkalines ONLY. ALKALINES, zinc-carbon and non-rechargeable lithium batteries go in the YELLOW bags for the July collection. No rechargeable or button types can be accepted due to federal regulations. How the July curbside collection works: During the month of July, OCRRA teams up with local waste haulers to do a door-to-door battery collection. 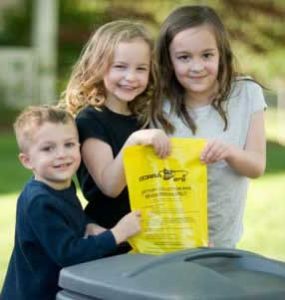 OCRRA provides residents with highly visible YELLOW battery bags and your hauler picks them up on regular trash collection days. To get a battery bag, email us – in the email, provide your name, address and zip code. We’ll be happy to mail a battery bag to you! Simply fill the battery bag with your ALKALINE, ZINC-CARBON or NON-RECHARGEABLE LITHIUM batteries. No rechargeable or button batteries are allowed. Place the battery bag on top of your closed trash bag or trash container lid. Please DO NOT place them inside your trash can or trash bag, nor in your blue bin. Haulers collect these batteries separately from the trash and recyclables and bring them to OCRRA for proper management. 3. Bring to the Ley Creek Drop-Off Site. Batteries can also be dropped off at OCRRA’s Ley Creek Drop-Off Site. Please separate rechargeable batteries from alkalines, zinc-carbons, non-rechargeable lithium and button batteries. Put each rechargeable in a separate plastic bag. 4. Over 50 Locations Accept Rechargeable Batteries. NYS Law mandates that rechargeable batteries be recycled. Trashing rechargeable batteries is an offense that can land you with a fine. OCRRA and Call2Recycle teamed-up to provide additional rechargeable battery recycling options to the community, while reducing operating costs. Learn more about this mutually beneficial partnership. See exactly how rechargeable batteries are recycled in Onondaga County by watching the Call2Recycle video below. Alkalines come in many different shapes and sizes. They are the typical household battery you would use in a remote control, radio, toy, smoke detector, etc. (AA, AAA, C, D, 6V, 9V, etc.) Some alkaline batteries look a lot like rechargeables and the only way to tell the difference is to read the label. Button batteries are small, flat, circular batteries often found in hearing aids, watches, calculators, etc. Don’t let their size fool you, they contain more heavy metals than most larger batteries, so it is very important to recycle them. Rechargeables are found in power tools, laptops, phones and other electronic equipment, etc. Also, some look like alkalines, but are rechargeable; check labels to determine if they are rechargeable. Annually, OCRRA’s battery collection programs collect 80,000 lbs. or 40 tons of material! If you are a business looking to recycle your batteries, click here. If you are a business interested in properly disposing of your batteries, you have several options. 1) There are many vendors that offer mail back programs, including Call2Recycle. 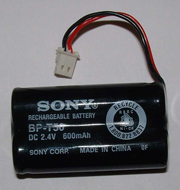 Search the internet for companies that do "business battery recycling" for other options. 2) Environmental Products and Services of Vermont is a local company that can give you more information on business battery disposal.